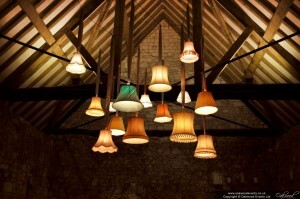 We were recently approached by a bride with a vision of installing a canopy of vintage lampshades for her barn wedding. The lampshades had already been sourced by scouring the local charity shops – our task was to assemble a custom lighting harness to light them and suspend them in the ceiling. We love a challenge so we collected the lamp shades and got to work. Many of the shades were originally intended for standard lamps, and therefore needed to be modified to suspend on a cable from above. A couple of weeks later the shades were all modified, the harness was built and we were on site installing it all in one of our favourite venues – the Monks Barn in Hurley. The installation went very smoothly and it looked superb! To discuss a custom lighting installation for your wedding or event, feel free to contact us.